There is no denying that hygiene demands have increased continually over the last few years. For example, compliance with industrial standards such as IFS and hygiene concepts according to HACCP are also posing challenges for the bakery and confectionery trade. However, perfect hygiene and food safety not only protect customers, they also form part of the marketing strategy and safeguard bakers and confectioners against damage to their reputation. Companies must now fully document their cleaning processes so that they can prove to food inspectors, in case of doubt, that they have a clean slate. Anyone wanting to be on the safe side will benefit from the concentrated competence of exhibitors in the service of cleanliness at südback in Stuttgart. They will present their innovations at the Stuttgart Trade Fair Centre from 22 to 25 October 2011. These innovations will include processes for cleaning and disinfecting machines, as well as methods on how to mechanically clean boxes, metal trays and baking tins with spotless results in a very short space of time. The exhibitors at südback will offer systems for perfect personal hygiene, cleaning technology and cleaning agents for every purpose, but also services relating to cleaning and hygiene. “The increasing automated processing of egg masses, fruit preparations, cream fillings and sauces, as well as the trend towards cut goods and convenience products call for suitable cleaning and disinfection processes that are adapted to production”, says Marcus Ley from Ecolab. The globally active company will present its programme for hygiene applications and management in Stuttgart. The tailor-made solutions not only cover hygiene demands, but also take account of business aspects such as water and energy management along with the use and storage of chemicals, i.e. both during production and at branches. The focal points are therefore not only safety and material compatibility, but also primarily the sustainability of the particular hygiene concepts. 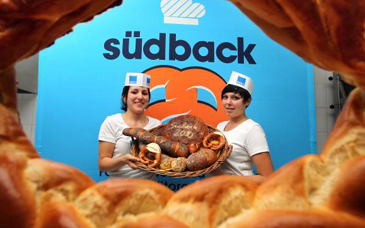 südback 2011 will feature a large number of strategies which companies can use to ensure better cleanliness for less money. Many cleaning processes now no longer require any chemicals whatsoever. Beam GmbH, a manufacturer of high-tech cleaning systems, will unveil at südback two new steam aspirators which fight dirt with steam and consume at most one tenth of the water amount which would occur during conventional cleaning. The machines steam and vacuum in one work operation during which the dust from the room air is also absorbed. The dishwashers from Hobart use ever decreasing quantities of chemicals, water and energy. The warewashing manufacturer will present a large number of innovations in Stuttgart. The BÄKO Technology and Packaging Division is also strongly oriented towards conceptional problem solutions since there will be interesting offers and innovations from the BÄKO line range. The proven dishwasher “BÄKO-line all in” will be demonstrated at südback in a special equipment variant with a three-year guarantee, free maintenance at the end of the warranty period, an additional universal basket and a Renosan cleaning starter set. “Anyone using sensible cleaning agents saves time and money”, says Florian Schmid, Managing Director of Renosan. According to him, the use of just any old cleaning agents sometimes harbours unsuspected risks. For example, baking trays may be damaged due to excessively aggressive substances. “These substances cause aluminium oxides to break loose from the surface of the trays during the baking process. Consequently, these aluminium oxides enter the bakery products”, says Schmid. Cleaning agents matching the utilisation purpose produce better results and exclude side-effects. Renosan offers well thought-out concepts for every application and size of company through to complete hygiene management.”If a bakery opens several new branches in one year, it should adapt its cleaning concept to the new conditions”, says Schmid. Daily cleaning and disinfection can be carried out more easily if the structural conditions in the company are suitable. They include, for example, hygienic wall panelling with a low number of joints, seamless and non-slip floors, but also easy-care work furniture made of stainless steel. Access controls and hygiene sluices are another safety factor. They prevent employees from bringing dirt into the production area. Access to production is only granted when hands have been washed and disinfected. During südback 2011 in Stuttgart, hygiene experts will explain in detail where the risks lurk in companies.